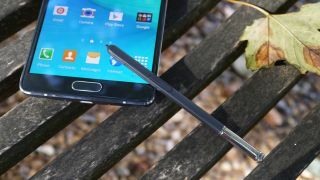 As sure as summer follows spring the Samsung Galaxy Note 4 will be followed by the Samsung Galaxy Note 5, but while we've always been fairly certain it's happening we're only now starting to hear specifics about it. According to Sam Mobile's sources the Galaxy Note 5 will have either a 2K (QHD) or 4K Super AMOLED screen and an Exynos 7422 processor. The 7422 is apparently set to be Samsung's first all-in-one solution, combining CPU, GPU, RAM, storage and the modem on a single chip. There's an outside chance that the Exynos 7430 could be used instead, as it's apparently being tested with this too, but supposedly that chip is just an engineering sample. Interestingly, although Samsung is also likely to release a new curved-screen phablet along the lines of the Galaxy Note Edge, it won't actually be a curved version of the Note 5. Instead according to these rumours it will have very different specs, with a 5.4 or 5.5-inch Super AMOLED dual-edge curved screen, a hexa-core Snapdragon 808 processor, a 16MP rear camera with optical image stabilisation, an 8MP front-facing one, 16GB of storage and an S-Pen. By the sounds of things then it might not be quite as high-end a device as the Note 5, assuming there's any truth to these rumours. It's also apparently going by the codename 'Project Zen', which had previously been attached to a Samsung Galaxy S6 variant. Hopefully we'll hear more soon, but we're probably still a way out from release yet, as going on past form we're likely to see the Galaxy Note 5 and Project Zen in September. Can't wait for the Note 5? The LG G4 has a phablet sized screen too.